Laksa is one of my favourite Malaysian dishes. Its aromatic and spicy soup is so versatile that you can put any seafoods, meats, or veggies to cook in it with amazing results. 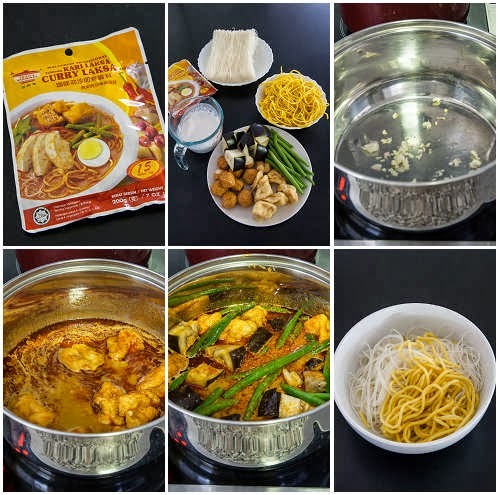 This quick and easy recipe can help you make an authentic laksa on the go. If you’re into eggs, pop in one of two hard-boiled eggs to ease your craving in your homemade laksa soup then. 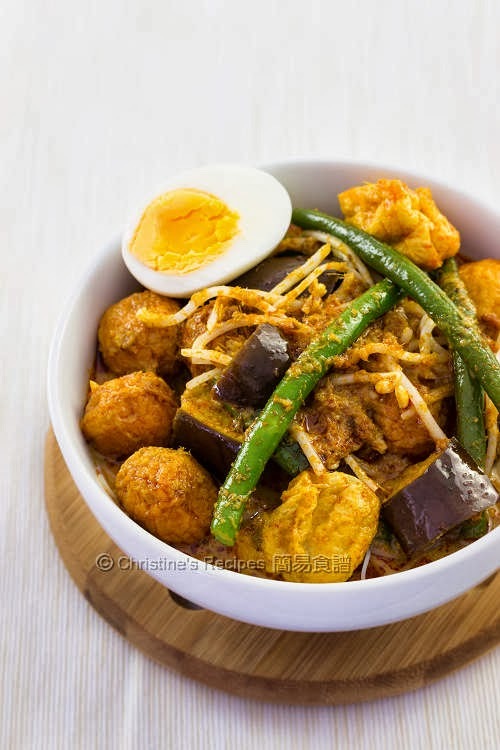 Once you have prepared the laksa soup base, you can tweak it in whatever way you like. It only takes ten minutes or so. You can use any commercial brands you like or handy to you. That will save you a lot of effort sourcing the ingredients to make the laksa paste. The other day I got a packet of Tean’s curry laksa paste (田師傅) from a nearby Asian grocer back home to try. My hubby is one of those who like spicy foods very much. The spiciness of the laksa soup can be adjusted by adding some more water or coconut milk along the way of cooking the soup base to suit your family’s taste buds. Briefly branch the bean sprouts in boiling water to remove the grassy taste. Don’t take too long. Drain well. Set aside. In a deep pot, sauté the garlic and shallot. Mix the laksa paste with the boiling water and pour into the pot. Add coconut milk. Bring it to boil over medium-high heat. Add in the tofu puffs. When it boils again, add the egg plant. Reduce heat to simmer until the egg plant is softened. Add green beans and cook to your preference of doneness. Add the fish balls and bean sprouts. In the meantime, follow the instructions on packaging to cook the rice vermicelli. Drain well. Blanch the Hokkien noodles in boiling water to remove the excess oil. Don’t need to boil it too long. It will turn mushy otherwise. Divide the rice vermicelli and Hokkien noodles into 2 to 3 serving bowls. Ladle the laksa soup on top. Serve immediately. Laksa paste is available at Asian grocers. The amount of water and coconut milk is recommended by the instructions on the Tean’s laksa package. If you use another brand, please adjust the amount. If you’re into hot food, add more laksa paste according to your preference. 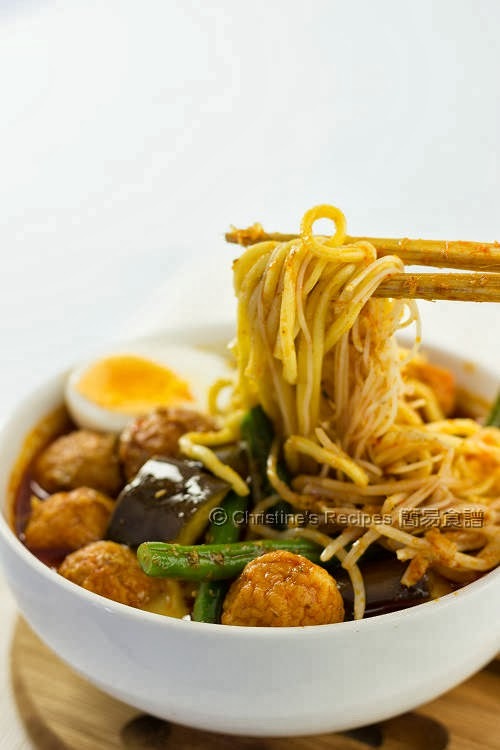 We used to have both rice vermicelli and Hokkein noodles in our laksa soup. It’s very delicious. 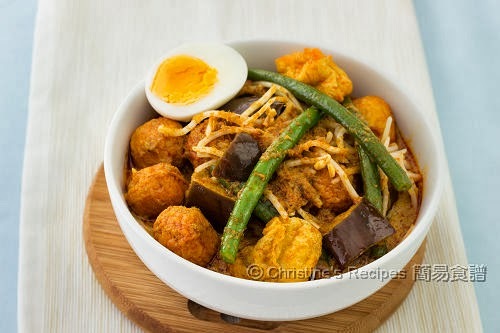 Green beans, egg plants and tofu puffs are going so well with laksa. Prawns (shrimps) and cuttlefish balls are good choices too. This looks really delicious. Must that laksa past when I visit Asian store next time. Do try it. It's really delicious. Christine, you are a wonder! This is a lovely dish to have on hand when you have bits of things and want to show some ingenuity! It can be changed up easily from the looks of it. Can't wait to try. Exactly ! This is another good way to clean up our fridge too. Good morning Christine! Thank you for sharing your bowl of delicious curry laksa. I am very fond of using Tean's curry laksa paste because it is so convenient. And what better way to keep warm during these wintry days! Great minds think alike. Yes, we need something like this to warm our body up. Happy cooking !